When far right groups try to downplay their reputation for violent extremism and present a more respectable face to the public they always have a credibility problem. Claims that an organisation is merely expressing the concerns of ordinary patriotic British citizens are rather undermined when there is clear evidence that the organisation’s leadership and a large section of its membership consist of hooligans, racists and neo-Nazis. Nick Griffin’s “modernisation” strategy for the British National Party repeatedly ran up against this obstacle and the English Defence League faces the same difficulty. In the EDL’s case the challenge of acquiring a cover of respectability is possibly even greater, as its leaders have rejected Griffin’s “suits not boots” approach in favour of a revival of the aggressive “march and grow” street politics of the ’70s National Front. As a result, the picture of the EDL lodged in popular consciousness is of a mob of lager-fuelled louts swaggering down the road chanting “Allah is a paedo” while throwing the occasional Nazi salute. Still, that hasn’t prevented the EDL from making a bid for political legitimacy. No doubt reasoning that it wouldn’t exactly strengthen their claim to be pursuing this progressive agenda if they turned up at Westminster on 8 October with the usual gang of drunken football hooligans shouting racist abuse, the leadership has decided that the demonstration will be organised by the EDL’s women members, known bizarrely as “Angels”, who are collecting names for a petition (“EDL Angels are not sick”) that they intend to hand in at Downing Street. But the EDL’s attempt cultivate a more moderate public image by placing women at the forefront of its campaign against Cameron is hardly assisted when the first name to appear on the petition is that of Hel Gower, PA to the EDL’s leaders and head of its admin team. In addition to holding the view that “Muslims are total scum bags” Gower is well known for her fascist sympathies, having declared her political support both for the BNP and for an openly Nazi groupuscule called the British First Party. And the record of other “Angels” is no better. The EDL recently promoted a woman member named Joanne Dickens as a heroine of the counterjihadist movement after she was assaulted by anti-EDL protestors in Tower Hamlets, only to be seriously embarrassed by the revelation that Dickens displays a white supremacist tattoo on her chest and has posted vile racist comments on her Facebook page. A few weeks ago the EDL’s former South West deputy regional organiser, Hayley Wells, appeared in court along with another “Angel”, charged with racially aggravated assault following a violent attack on a Plymouth kebab shop. Last month an EDL supporter named Charlotte Davies pleaded guilty to a charge of racially aggravated criminal damage after racist slogans were daubed on a mosque and other buildings in Hartlepool. And another woman, Tracy Manning from Halifax, was jailed for nine months after glassing a pub landlord who asked her and her friends to leave because they were drunkenly chanting support for the EDL and BNP. Clearly, there is no guarantee that EDL members will be any less attracted to racism, fascism and violence just because they possess two X chromosomes. An article posted on the EDL’s website last week continued their fraudulent efforts to rebrand the organisation as a voice of reason and moderation. It took the form of a polemic against a “nationalist demonstration”, which is to be held in West Yorkshire on the same date as the Angels’ Westminster protest with the objective of “Defending our culture against multiculturalism, immigration and Islamic invasion”. At the centre of the coalition of far rightists behind this initiative are the Infidels, a group made up mainly of disillusioned former EDL members, who unlike the EDL leaders do not try to hide their racist views, fascist sympathies and propensity for violence. The EDL’s public position, therefore, is that it has nothing in common with and is vigorously opposed to the far right. The article goes on to state that a notorious Nazi who inexplicably got to participate in the EDL’s 9/11 demonstration outside the US embassy in company with their Essex organiser is now persona non grata: “Eddie Stamton, and any other neo-Nazis, are not welcome at EDL demonstrations, and will be ejected whenever they are identified.” Nor is the EDL racist, apparently. “We believe that it doesn’t matter where you are from, or the colour of your skin”, the article piously declares, “as long as you subscribe to a common set of values – values that make this country what it is.” Indeed, we are told that the EDL’s supporters have intervened on the Facebook page advertising the West Yorkshire demonstration “asking for racist comments to be removed”, only to have their requests ignored by the Infidel admins. The double-talk and hypocrisy on display here make your jaw drop. The far right background of prominent figures in the EDL is well established. 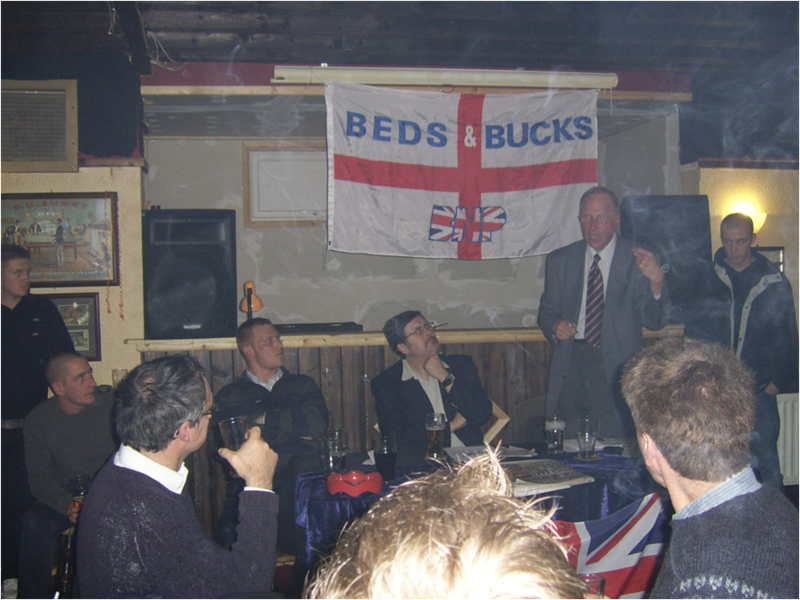 We know that EDL leader Stephen Yaxley-Lennon (“Tommy Robinson”) joined the British National Party in 2004, and he was photographed in 2007 at a Luton BNP meeting where the speaker was the veteran fascist Richard Edmonds. That same year EDL co-leader Kevin Carroll reportedly had to be dissuaded by his partner from standing for the BNP in the local elections in Luton. He did however sign the nomination papers of BNP candidate Robert Sheddock/Sherratt, who Searchlight have identified as a supporter of the November 9th Society, the neo-Nazi group behind the British First Party that is so admired by Hel Gower. Nor have the publicly expressed fascist sympathies of Gower herself prevented her from occupying a position at the head of the EDL’s administrative apparatus. As for the EDL’s supposed rejection of racism, the same day that the EDL published the claim that its members had criticised the Infidels for their racist views, the admins at the EDL’s own Facebook page posted a link to a report that a Muslim free school in Blackburn had been accused of encouraging segregation. This immediately provoked a spate of abusive comments from EDL supporters that rivalled anything by the Infidels. Some took the view that it was perhaps better that Muslim children were educated separately (“i wouldn’t want my kids going to school with the dirty scum”). Others emphasised the danger posed by such an all-Muslim institution (“The school will no doubt become a breeding ground for future terrorists, as they preach Islams evil doctrine of hate”). And this was accompanied by increasingly vicious threats against the Muslim community (“there is no future for the English as long as one Muslim continues to live on British soil. 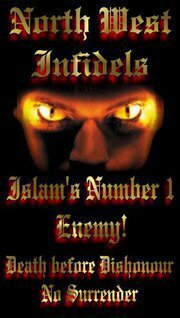 There is a war going on”, “it will be just be a matter of time b4 people in the UK start taking things into their own hands to fix this muslim infestation problem”, “BURN THE DIRTY SKIN BASTARDS ALIVE!!!”). EDL members do not stop at posting racist comments on Facebook – many of them have proceeded to put their violent Islamophobic rhetoric into practice. In contradiction to the EDL’s lying claim to be “peacefully protesting against extremism”, over the past couple of weeks alone a number of its supporters have received prison sentences after being convicted of offences involving anti-Muslim violence. Two of them, Darren and Wayne Edwards, got 14 months each for an attack on a kebab shop in Gillingham, while another EDL supporter, Daniel Parker, was sentenced to 8 months for religiously aggravated harassment after admitting to his involvement in an EDL gang that threw stones at the Muslim Community Centre in Barnsley and shouted racist insults at its imam. Earlier this week four yobs were jailed for a total of over 12 years, having been convicted of a violent assault on Redbridge Islamic Centre in which they smashed windows, threw a brick at the imam and racially abused worshippers – while one of the attackers, Harry Deluca, repeatedly screamed “EDL”. Up to now EDL supporters have restricted themselves to engaging in this sort of basic thuggery, along with the occasional arson attack, and so far thankfully no one has been killed. 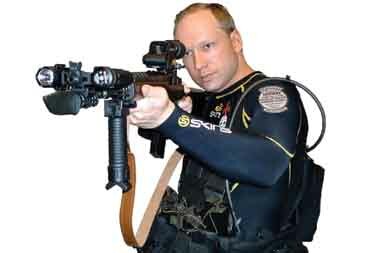 However, given that Hope not Hate recently posted photographs of EDL supporters posing Anders Breivik-style with guns, you can only wonder how long it will be before one of them follows the Norwegian terrorist’s example and decides to translate their own murderous fantasies into reality. In view of the gulf between the EDL’s bogus claims to respectability and the glaring reality that it is an organisation full of violent racists, led by people with a background in organised fascism, you might think that nobody would buy the argument that the EDL is anything other than a component part of the far right, and a particularly dangerous one at that. But you would be wrong. The influence of such views at Scotland Yard certainly helps to explain the response of the Metropolitan Police to the EDL’s intended march through Tower Hamlets earlier this month. The Met showed extreme reluctance to apply for a ban under the Public Order Act and only did so after an extended campaign by Mayor Lutfur Rahman and others. And when the EDL announced they would hold a static protest instead, the Met went out of their way to facilitate this attempt to intimidate the East End’s Muslim community. The Met’s original plan was for the EDL to muster at Hainault station and then be transported by special non-stop trains to Liverpool Street, where they would assemble before being escorted by the police to a protest point in the centre of Tower Hamlets. It was only firm action by the RMT and the mobilisation of the local community against the EDL that prevented the Met from implementing that plan. A new study published by the University of Northampton, The EDL: Britain’s ‘New Far Right’ Social Movement, situates the EDL within a “new far right” that formally repudiates neo-Nazism, justifies the targeting of minority communities on the basis of culture rather than race, publicly renounces antisemitism in favour of Islamophobia, and “combines an extremist ultra-patriotism with a tendency to present mainstream politics as in a critical state of decay and disorder”. Whether there is a clear distinction to be made between the actual practice of “new far right” formations and that of more traditional organisations which have evolved directly from fascism seems to me questionable (Paul Jackson, the main author of the study, accepts that “boundaries here are fuzzy”). However, the authors’ unhesitating categorisation of the EDL as part of the far right, in contrast to the much more equivocal position adopted by Nigel Copsey in his earlier study, does provide the basis for an accurate assessment of the movement. It might be an idea for someone to send a copy of that chapter to DCS Tudway.